IBF world champion Lee Selby says he will fight anyone in the ultra competitive featherweight division after his second successful defence. Selby retained his title with a unanimous points win over Eric Hunter. British rivals Carl Frampton and Josh Warrington as well as Mexican Leo Santa Cruz have been touted as opponents. "I'll fight anybody but l will leave it to my management and my promoter to pick," he said after being knocked down for the first time in his career. "I'd fight anybody in the ring if my team are confident of me beating them." 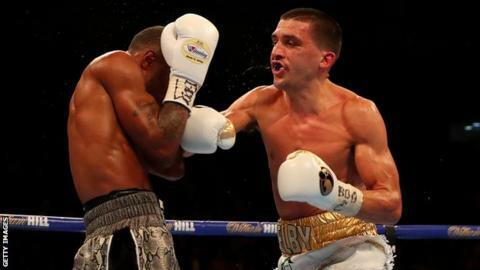 Selby first became world champion by beating Evgeny Gradovich in May 2015, then was successful in his first defence against Fernando Montiel in Phoenix, Arizona in October. The 29-year-old from Barry had said he had the option of big fights if he overcame American Hunter at London's O2 Arena. Selby, who had promised a 'tear-up' against his American opponent, made a confident start but found himself on the canvas for the first time in his career during the second round when a peach of a left hook caught him off-guard. The Welshman dominated proceedings thereafter, landing with his right hand almost at will and won comfortably, 115-111, 116-110, 116-110 on the judges' scorecards. "It was a good fight and another good learning fight," Selby added. "He was the number one challenger so obviously he was a very good fighter. "I got put down for the first time in my life. "It was a new experience as I've never seen the world from down on the floor before and hopefully I don't get to see it again."